Apart from this, we also provide Diode End-Pumped Laser Marking Machine, Laser Spot-Welding Machine and Side-Diode Pumped Series Laser Marking Machine. Our range is procured from leading vendors of the industry. Moreover, we also offer after sale service to our clients. 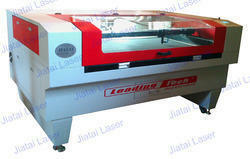 cO2 Laser Cutting and Engraving Machine . • Excellent Extensive service .